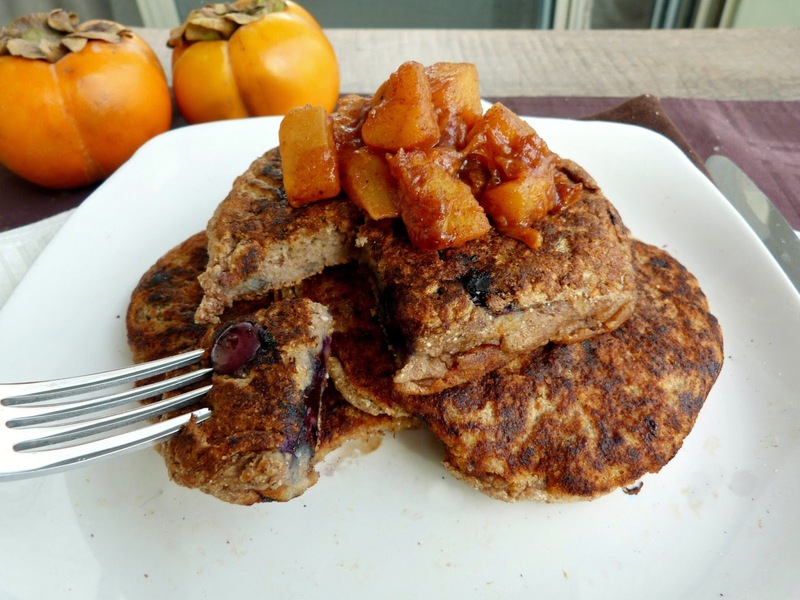 I've never cooked with persimmons so I would have never thought to use them with pancakes, but from your description of their taste, it sounds like the perfect idea! 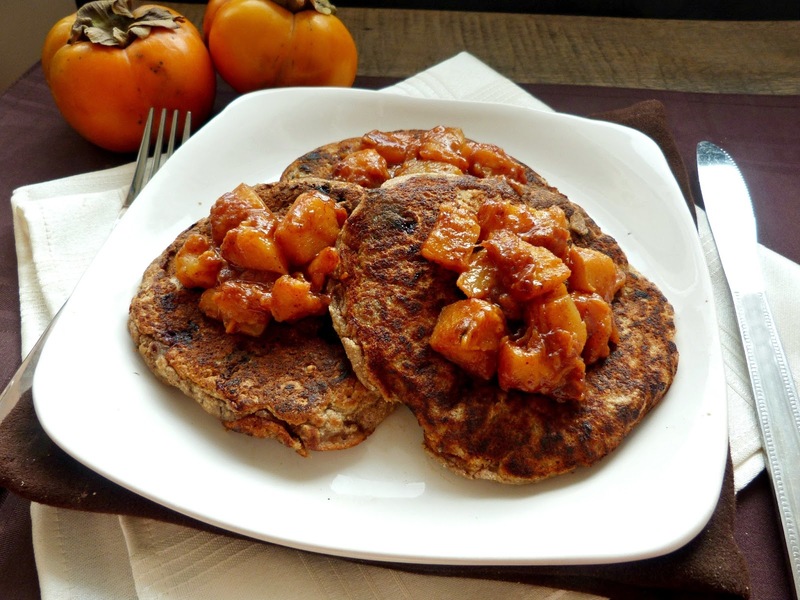 Thanks - They were pretty easy to work with, and I figured an apple compote makes sense on top of pancakes, so why not persimmons? These sounds great! 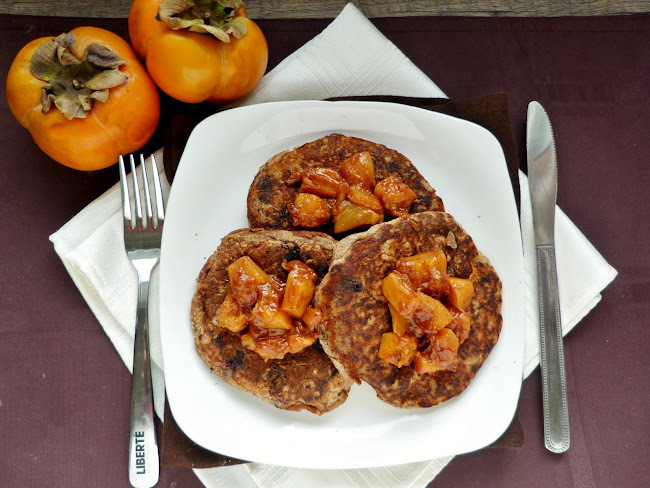 Love the persimmon topping! YUM! These look incredible. Great idea with the persimmon topping. Thanks! I always love pancakes but I don't make them very often...I should change that, especially when there are so many kinds of pancakes I want to try! I haven't had persimmons in so long, but I've been eying them at the store recently. The spices you added to the topping would be so perfect with them! I don't see them in the stores much, but I had been eyeing them at the farmers market. I loved how they tasted like there were spices in the fruit itself, and then adding more spices to the topping brought out those flavours even more! I've got two trees in the garden, we call them Kakis. I don't like the fruit and don't know many people who do so can't give them away. The tree is quite pretty with its large green leaves and the fruit looks pretty at the beginning of winter when the leaves have fallen and it is hung with orange balls. But I wish the damn things wouldn't keep dropping to go splat, splat splat and make goo on the gravel drive.I'd cut the damn things down if the birds didn't like them so much.